We implement the PSAT registration early because we have to meet very specific deadline dates in order to secure enough test materials for the October test. Most of the ordering has to take place prior to the summer break. For that reason, we ask that you register by June 12 for the October administration of the PSAT. 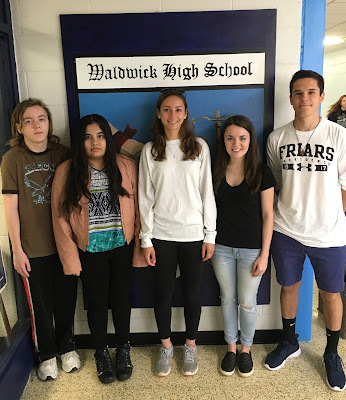 Starting next year, Waldwick High School will be changing its daily schedule to a rotating/drop schedule. We have been working on this as a school community for the last two years and we truly believe students will benefit from this new schedule. Next week (Week of May 22) we will be running the new schedule as a practice run for next year. I have meet with all students and explained the schedule and how it works. I have created a short video for the parents/guardians to explain the schedule and some of the details related to it. I will be hosting two informational sessions on the new schedule to share more details and answer any questions. YEIMI REQUENO SALMERON - Yeimi, a freshman, earned a 98 in ESL third marking period and has also achieved the Waldwick High School Honor Roll for two consecutive marking periods. Yeimi’s motivation to learn English and her incredible work ethic have helped her to acquire the language very quickly. Within less than a year of beginning to study English, Yeimi began earning grades high enough to achieve honor roll. We are excited to see her continue on this path and to find out where she decides to use her talents in the future.